ATLANTA, November 8, 2017 /3BL Media/ - UPS (NYSE: UPS) today announced the launch of an eBike that will deliver packages in Pittsburgh, Pa. The electrically-assisted tricycle will help reduce carbon emissions in addition to traffic, noise and air quality challenges in Pittsburgh. The deployment is part of UPS’s Cycle Solutions and the company’s Rolling Laboratory, which tests alternative fuels and advanced technology vehicles. 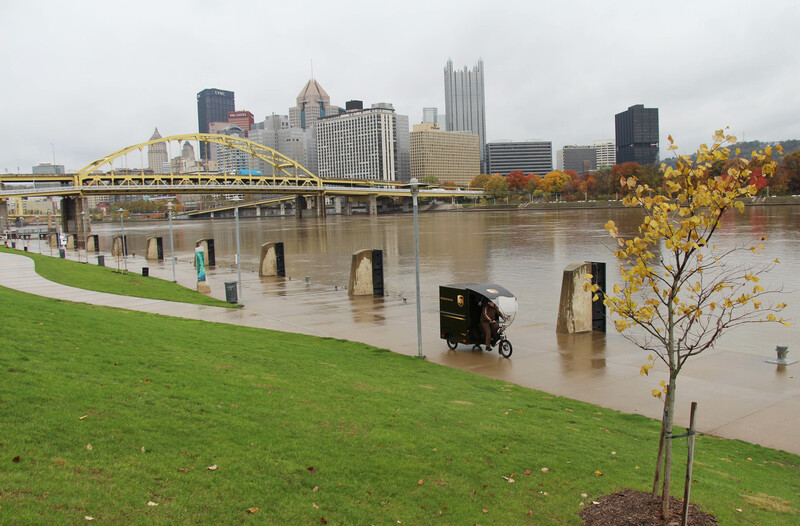 “In Pittsburgh we welcome solutions like the UPS eBike to reduce traffic congestion and tackle urban growth,” said Pittsburgh Mayor, William Peduto. “We encourage companies like UPS to work with our residents and businesses to create innovative solutions to the complex urban challenges we face every day. This effort aligns perfectly with the ONEPGH Resilience Strategy and our efforts to make Pittsburgh a thriving 21st Century city that is livable for all." The eBike is equipped with battery-powered electric motors that makes it possible to cover longer distances than traditional bikes, carry substantial loads and navigate hills and other terrain. Maximum energy efficiency is achieved when combining battery power and human power simultaneously. The eBike can be operated solely on battery power or pedal power. UPS will evaluate the reliability, design, integration to the city’s infrastructure and acceptance of the vehicle. The intent is to operate the eBike in Pittsburgh as weather permits on a regular route year-round. UPS (NYSE: UPS) is a global leader in logistics, offering a broad range of solutions including transporting packages and freight; facilitating international trade, and deploying advanced technology to more efficiently manage the world of business. UPS is committed to operating more sustainably – for customers, the environment and the communities we serve around the world. Learn more about our efforts at ups.com/sustainability. Headquartered in Atlanta, UPS serves more than 220 countries and territories worldwide. The company can be found on the web at ups.com® and its corporate blog can be found at longitudes.ups.com. To get UPS news direct, visit pressroom.ups.com/RSS or follow @UPS_News on Twitter.